Which site will you learn guitar from in 2019? So you just got your first guitar, and are looking for a way to learn to play? Or you've been playing for a while, and want to take things to the next level? Using the best online guitar lessons to learn guitar is a very efficient and cost-effective way to advance your chops, no matter what level you are at. I have been playing guitar for 20+ years and teaching for 15+ years. I still use online lessons to learn new things almost every day. If you are interested in which online guitar teaching websites I use and can honestly recommend, and also which ones I stay away from, read on. I will also list my favorite guitar YouTube channels on this page. How are you learning guitar? This turned out to be a pretty long article, so here is a table summarizing the top lesson sites I can wholeheartedly recommend. I have had accounts with each of these sites and have used them extensively for years. Continue reading for a thorough review of each of these sites, with pros/cons of each and who they are best suited for. GuitarTricks was established in 1997 in San Francisco. It was one of the first video guitar lesson companies on the internet, and as such, basically invented the industry. They have grown along with the internet, presently employing about 40 guitar teachers to record their lessons. 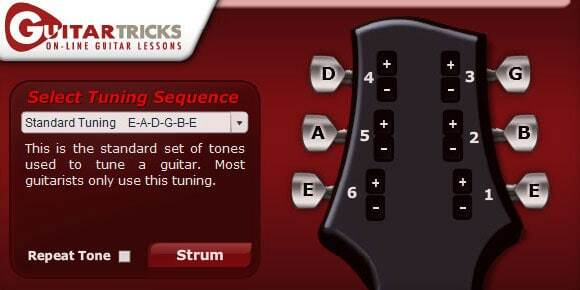 The backbone of GuitarTricks' offering is their "Core Learning System". This is basically a collection of courses meant to take a complete beginner all the way to an upper-intermediate level. These 3 genre courses are well thought out and structured, just like their beginner courses. It's important to note that the lesson hierarchy is important, and should be learned in sequence. A lot of times, beginner guitarists will skip a section they find difficult. Don't do that. Practice as much as you need to before moving on to the next section, otherwise, you will have holes in your knowledge and get stuck later on. Beside the 3 main genres of covered by the Core Learning System, GuitarTricks has mini-courses on several other genres as well. These are not lengthy courses to teach you an entire genre. They merely cover smaller niche topics of a given genre. This is more of a collection of funk topics, rather than an A to Z course on funk guitar. Sometimes you don't want to sit through a course which will take weeks to cover. Sometimes you simply want to learn a song you love. After all, that's why you picked up the guitar in the first place. The song lesson collection of GuitarTricks is very strong. They have a massive amount of very popular songs to learn from a large number of artists. Some people say that taking private guitar lessons held by a live teacher is the best way to learn guitar. While I disagree with this statement for a number of reasons (money, appointments, accessibility, etc. ), there are times when it's nice to be able to have somebody to ask a few questions. GuitarTricks takes care of this, as you can buy private, 30 or 60 minute online lessons from a few of its teachers. Learning mostly from prerecorded online lessons and having the means to talk with your online instructors is the best of both worlds. Who can get the most out of GuitarTricks? Are you a beginner or intermediate guitarist? Then I can honestly recommend GuitarTricks. Follow their lesson curriculum, be diligent, and you will learn guitar with this site. 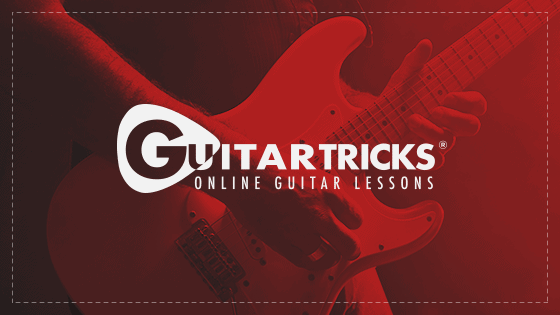 If you are interested in signing up with GuitarTricks.com, make sure you have a look at this GuitarTricks discount, and their free trial offer as well. Just checked them both (April 2019), they are valid. Jamplay is another large guitar tutorial website. It was established in 2006 in Ohio and features lessons from about 70 guitar teachers and music professionals. Besides publishing a large number of lessons, they also focus on innovation. For example, they employ the largest number of camera angles out of any lesson site I've seen and they have great online guitar tools. 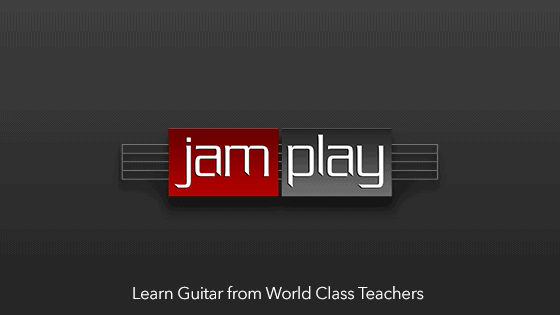 They also contract established musicians to create guitar courses exclusive to Jamplay. They take a vastly different approach as compared to GuitarTricks, I'll show you why in a second. Let's have a look at the beginner lessons page on Jamplay. They presently have 20 courses for beginner guitarists taught by different teachers. Some are good, some are not. I don't really think this approach is all that great though, because a beginner needs a set path to follow, not 20 different paths to get lost on. The genre lessons are much better on Jamplay than their beginner lessons in my opinion. They take the same approach, that is offer courses by a number of teachers. This is not a distracting factor though, since intermediate players need the variety the methods of different teachers can offer. Again, with this many teachers, there are good ones and bad ones. You can weed out the bad ones very quickly. The song lesson database is much smaller on Jamplay, and the songs that they have are not as good as GuitarTricks' song lessons. There are only a few famous artists to choose from, so this isn't one of Jamplay's strong points. This is where Jamplay really shines in my opinion. They offer lessons by real artists, which is great for advanced guitarists. Also, they have a large number of lessons dedicated to mastering various skills on the guitar. This is great, because I myself have struggled with speed picking in the past. Jamplay's Speed and Technique courses, of which there are 8 at the moment. If you have been playing for a while and want to focus on targeted topics, they will definitely have a course (or several) to help you out. Here are a few screenshots of Jamplay from my account panel. Who is Jamplay best for? While I think there are better sites for beginners, intermediate and advanced players will really benefit from the barrage of lessons Jamplay has in store. 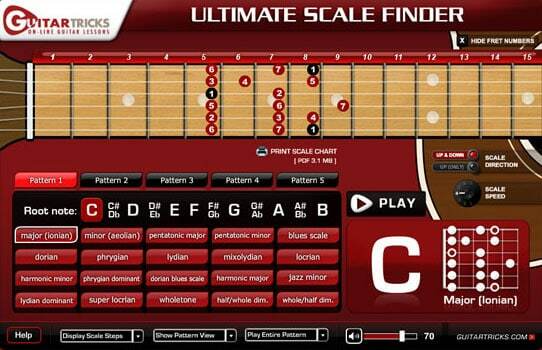 The chord and scale finder tools are also very useful to experienced players. They are constantly releasing new courses, so you will never run out of things to learn if you choose to sign up with Jamplay. Here are 2 coupon codes you can use on Jamplay (last checked April 2019). 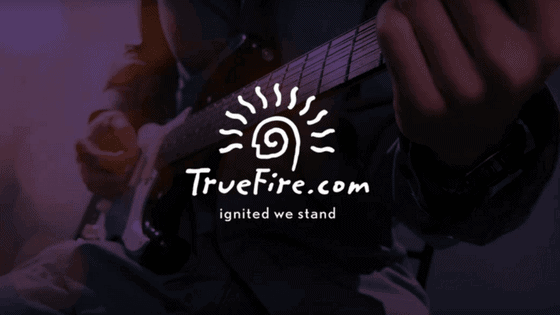 TrueFire was established in 1991, before the internet was a "thing". They initially dealt with creating and distributing VHS & DVD lessons and got into online tutorials later on. Their lessons cover every imaginable aspect of playing guitar, but the most unique thing about TrueFire is their teachers. They have big names like Tommy Emmanuel and Steve Vai teaching courses, which is great news for advanced guitar players looking to learn the tricks of the pros. The Courses section is a big melting pot of all of their lessons. Having this many lessons means you have to have advanced search & filter functionality. Thankfully they have one, albeit it's a bit slow. But it works. Once you select a main topic, you can filter your results based on skill level, style, teacher, curriculum, and instrument. The result of this will be that you hone in on a course that you are interested in. As with Jamplay, many of the resulting courses have overlapping material taught by different teachers. Having such a large number of lessons and courses means it's easy to get overwhelmed. And as we know, too many choices is never a good thing for guitarists. They just end up jumping all over the place YouTube style. Perhaps this is the reason TrueFire introduced their so-called Learning Paths. These paths are meant to take you from a newbie guitarist, all the way to an advanced guitar master in your chosen genre. In practice, what TrueFire does is it takes individual lessons from their various courses and structures them. This way, you don't end up bouncing in between courses. The result is very long Learning Path. In fact, if a beginner was to start one and follow all of the lessons, it would probably take years to finish. For example, I wrote a detailed review of their Blue Learning Path, which you can read here. The song lessons section of TrueFire is not very good. If you're looking to mostly learn popular songs, you should choose another website. They have "in the style of" lessons and some songs by Tommy Emmanuel, but nothing to get excited about. The site offers 1-on-1 personalized lessons with a lot of its teachers. You record a video of yourself playing, asking questions, etc. and upload it to TrueFire. Your chosen teacher watches your video and responds with a video of his/her own. This is an interesting approach to 1-on-1 lessons. TrueFire developed a nice piece of software called In the Jam. You need to buy these In the Jam tracks separately though, they are not part of the monthly/yearly membership. Who is TrueFire best for? I can honestly recommend TrueFire to intermediate guitarists looking to get out of a guitar rut, and advanced guitarists who want to learn from great musicians. In fact, I am an ongoing member at TrueFire myself. I gravitate towards the more advanced courses as my time permits. Beginner guitarists will get a lot out of TrueFire as well. The beginner lessons are easy to follow, have lots of playalong lessons, and you are transitioned into genres smoothly with their Learning Paths. If you are thinking of signing up with TrueFire, here is a 25% coupon code. If you've typed anything guitar lesson related into YouTube or Google, you will undoubtedly have come across Justin Sandercoe. He has been creating YouTube lessons since 2006. The thing that makes his lessons unique on YouTube is that he structures them into courses on his website. This means that he doesn't just offer your random YouTube lessons. He has interconnected lessons published on YouTube, that all come together as guitar courses on his site. Justin creates great lessons, which are informative and accurate. They are filled with loads of info and tips that not many teachers can provide. The lessons on JustinGuitar are free to watch, with a bit of fine print. There is no free lunch per se. YouTube inserts ads over, before, and during the videos, so your viewership is being monetized. Also, the tabs are only available if you buy books directly from the site, which are a bit overpriced in my opinion at around $25 per book. Regardless, if you want to spend $0, you can learn guitar with Justin's lessons, it'll just be a bit slower and more difficult. The lesson hierarchy on JustinGuitar is very logical. There are beginner modules, blues, simple jazz, and even a basic funk course. As Justin is the only teacher on the site, there is no real overlapping material, as you find on the larger sites. Beginners have 9 modules to advance through, each with about 10 individual lessons. Each module has a set of recommended songs to learn, which have their own dedicated video lessons as well. As I mentioned before, if you want the tabs, you need to purchase that. Justin has recorded hundreds of lessons on songs, which are available on YouTube and also his website. There are about 500 song lessons at the moment, but the lessons are easy to navigate thanks to the nifty filtering system on his site. As I mentioned before, the lessons do not include the tablature. You would have to buy the tabs in a songbook, or jot the tablature down yourself. Who is JustinGuitar most suited for? Beginners and early intermediate players who don't have any money to pay for online lessons can learn guitar on the site for free. It will be a bit slower and less efficient than paid-for lessons, but it might still be the only choice for you if you can't spend any money on guitar lessons. TheGuitarLesson.com was founded in 2008. The concept behind the site was to offer beginner guitar players a fun way to learn guitar, through learning songs. Tom Fontana is the sole guitar teacher on TheGuitarLesson.com. This means that there aren't as many lessons as on sites with dozens of teachers. The site's entire beginner's course is centered around songs. Each chapter teaches new techniques, which are meant to be practiced through learning a set of recommended songs. Learning songs early on helps keep beginners motivated and practicing more. One of the main reason many newbies end up quitting is that they are made to do boring exercises. Practicing songs helps keep each practice session fun and exciting. Perhaps the best part about the video lessons on TheGuitarLesson.com is the animated tablature that runs on the screen as the video progresses. This really helps in keeping the lesson as simple and easy to follow as possible, which is very important to beginners. The site does not upload to YouTube often, but here is a lesson which shows the animated tabs in action. This is a unique feature few websites have. As I mentioned, learning popular songs is the main thesis behind TheGuitarLesson.com. As such, the collection of song lessons is large. There are lessons in every genre and difficulty level. If you follow the lessons and the supplementary material, you'll learn guitar relevant music theory in a seamless way. Tom sprinkles in a bit of theory with each lesson, and the extra material is worded in a way which makes it easy to comprehend. Here are a few screenshots of the site I made for you, which illustrate what TheGuitarLesson.com is all about. Who can benefit from TheGuitarLesson.com? Beginners who are just starting out will get the most out of this site. The animated tabs on every video make following each lesson as simple as possible, and Tom does a great job of breaking the more complicated guitar concepts down so newbie guitarists can understand. Now that you have read through what I believe to be the best online guitar lesson websites, you probably have an idea of which one is best for you, as a beginner guitarist. GuitarTricks is a great choice, as the beginner courses are very well thought out and structured. They can take you from 0 to upper-intermediate level in blues, rock or country. 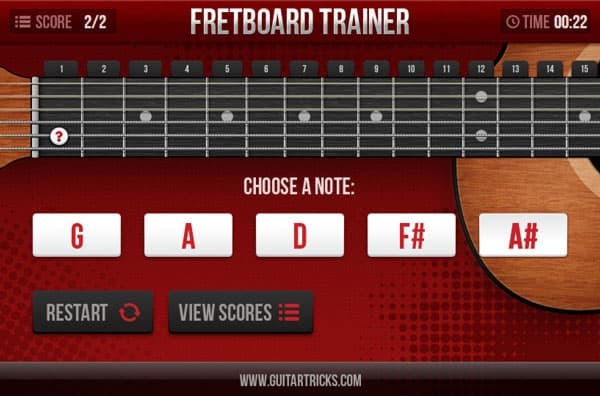 Remember that GuitarTricks has a free trial and coupon codes. Many guitar players reach a certain level where they can play a lot of things, but somehow get stuck. This is the intermediate level, where loads of players reach what is known as a "guitar rut". The key to advancing from this stage is to start learning new things. JamPlay and TrueFire have hundreds of great stand-alone courses, perfect for intermediate players in need of new material to learn and practice. I can honestly recommend both of these sites. Here is a JamPlay coupon, and a TrueFire coupon. Extra tip: At the intermediate level, you are ready to start jamming with others. Ask around your circle of friends, look online for musician meetups or groups. Getting together with other musicians is very beneficial, and loads of fun of course. Finding lessons that can challenge and further develop an advanced player is hard, as not many sites offer them. JamPlay has a section called Artist Series, where they have lessons taught by performing artists such as Mike Dawes and Erik Mongrain. TrueFire has loads of lessons for advanced players as well, called Masterclasses. There are a LOT of guitar related YouTube channels out there. While I believe beginners should not learn guitar from YouTube, intermediate and advanced players can satisfy their quick-hit guitar lesson needs nicely on YouTube. Here are the guitar YouTube channels I like and can recommend. This is actually a channel for an instrument store in the UK. Their videos are loads of fun to watch and learn from. The hosts are witty, play great guitar, and provide a lot of insight. Brian, the host of the channel, publishes mostly intermediate level blues lessons on his YouTube channel. He composes his own music and breaks things down in a logical way. This channel publishes not only guitar lessons, but drums and singing lessons as well. It is in Portuguese, but the on-screen tabs let you follow the lessons seamlessly. Goes to show you that the language of music is universal. I love Nick's channel for the playalong videos. You can really tell that he has a lot of experience in playing with others. His videos aren't well lit, they're not shot with a $4000 camera, but they are still great to watch and learn from. This channel concentrates on teaching songs in a simple way, so it's ideal for beginners. Dave, the host of the channel, breaks things down nicely and adds on-screen tabs to his video to make them easier to follow. Marty Schwartz is one of the longest-running teachers on YouTube. He has a lot of videos on songs and various techniques. A lot of people follow him, in part because of his energetic, fun teaching style. Paul David's channel is about everything guitar. His calm, laid back style, combined with a cool sense of humor make his videos fun to watch. This is another fun channel which isn't strictly about guitar lessons. Sean Daniels has a great personality and his videos probably more entertaining than they are educational. They don't look particularly good, they are not professionally edited, but they are still fun. These were my favorite YouTube channels that publish guitar lessons and other interesting guitar related videos. If you know of other ones that are great, please leave it in a comment, I'll have a look. But please don't just spam and self promote your own channel. Unless it is outstanding that is. There are a lot of recurring questions I get at TheGuitarLesson.com, and that I see online in forums and even sites like Quora. Here are answers to the most common questions, some of which you are probably asking yourself as well. Can you learn guitar online? Yes, there is no question about it. Find a course you like, stick with it, practice every day. That is all you need to learn guitar. Are private teachers better than online lessons? No. Quality online lessons are better than live teachers in a lot of ways. And they are much-much cheaper. The cost aspect is important as well. A teacher will charge around $40 for a 50-minute lesson. It adds up very quickly. An online course will charge around $140 for unlimited lessons for a year. The only advantage private teachers have is that you get to interact with them and possibly meet other guitar students, but that is not worth thousands of $ a year. You can meet other musicians in a lot of ways, they are open people: ask your friends; check meetup.com; hang out at a local music shop. How long does it take to learn guitar online? This depends on how much you practice, and what your goals are. I have a longer article dealing with the subject here. Free or paid online lessons? You know the saying, "You get what you pay for." Nobody works for free. Would you? If you want to learn to play guitar quickly, you will need to pay for access to a paid guitar lessons site which has top-notch courses. The only exception is JustinGuitar. You can access his lessons in a structured manner on his site for free. You will still need to pay to get the tabs and songbooks though. There are some sites I would not recommend learning from/paying to, either because their lessons are low quality, not thorough enough, or just not a good value for the money. Jamplay, GuitarTricks and Truefire really set the standard in terms of price/value, so sites charging similar amounts (or more) for much less material are expensive in my opinion. Fender Play - While Fender makes great guitars, their journey into online teaching isn't good. Their lessons are rehashed and not thorough enough to teach beginners. Jamorama - The original version of Jamorama was an ebook, supplemented by video snippets. They have transformed into a membership site, where you get access to their courses. The thing is that for the $100 you would pay, they have too few lessons, few courses, no online tools, etc. What they have is good, I really like Mark the teacher, but you can get better value elsewhere. Guitareo - Same problem as Jamorama. What they have is good, but at $100-$200, you can find more/better lessons elsewhere. Yousician - See my full review of this app here. After reading all of the above (good job if you made it this far by the way 🙂 ), you should be familiar with the top guitar lesson providers on the net. Whichever you choose, you are in good hands, as the lessons are structured well and provide good content. Choose a site, grab your guitar, and start learning. Remember that when it comes to learning guitar, practice is everything. If you are diligent and practice every day, you will advance your guitar skills and reach your goals. If you have any experience of your own with the sites above, or just want to share how you are learning (or have learned) guitar, leave a comment below so that others can benefit from your experience.